PST . . . Would you like to know the biggest secret to educational success? It is the Parent - Student - Teacher Link. What is it? 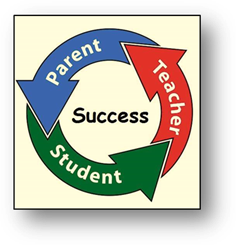 It is a chain of cooperation between parent and teacher held together by one common interest: the student. Mutual understanding of our respective roles is the glue that holds the chain together. Open, constructive communication is the key ingredient of that glue. Sticky situations can be avoided by trying to accentuate the strengths of the other links in the chain rather than emphasize the weaknesses. We are only as strong as the weakest link, so let's attempt to strengthen each other.